WhatsOnTapAt™ provides your bar with a way to manage and display your list of tap and/or bottled beers on big-screen TV(s) and on your customer's cell phones. It also updates your website and sends out Tweets and posts to Facebook every time you change a tap - so your tap list is always up to date! It can save you substantial money if you print beer menus often, and it will save you hours every week by taking care of the website updates and posting on Twitter and Facebook. Every time you change a beer on tap, ALL of your chalkboard(s) automatically change - INSTANTLY! Built in WhatsOnTapAt Passport™ loyalty program keeps your customers coming back! Designed for Beer and also works great for other artisanal products like Wine, Cigars, Spirits (e.g., Scotch or Tequila list), Cheeses, etc. Get WhatsOnTapAt™ for your bar! For more information about WhatsOnTapAt, and getting it set up in your bar, email us at info@WhatsOnTapAt.org. 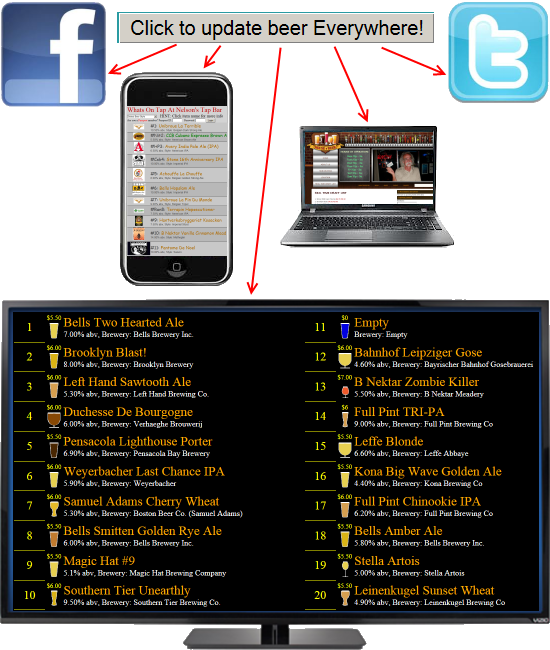 WhatsOnTapAt™ can show your beer list in many different configurations...Check them out! What are the next steps after you've decided that WhatsOnTapAt™ is what you need? To set up the big-screen TV, you will need to have either a Smart TV (that supports web browsing), or a GoogleTV box and HDMI cable to plug into a TV. We can provide several recommendations for the GoogleTV box (about $100, but sometimes discounted to $40 on Amazon) - Hi-Sense Pulse, Netgear GTV100, Vizio CoStar, and others - but be SURE you get one that has a built-in web browser. You will also need Internet access - preferably a Wi-Fi hotspot in your location with a strong signal. To print Growler labels, you'll need a small label printer. We recommend the black-and-white Brother QL-700 ($100 at Staples), or you can get a color label printer. Plug the printer into a laptop that is near the bar (or plug it in to your POS terminal if it's Windows based and can print to other printers).